When an image is taken by our infrared camera, it is digitally saved to a hard drive and later converted to a digital image file with the help of a computer. The image may then be modified in a number of ways to enhance its value to the end user. 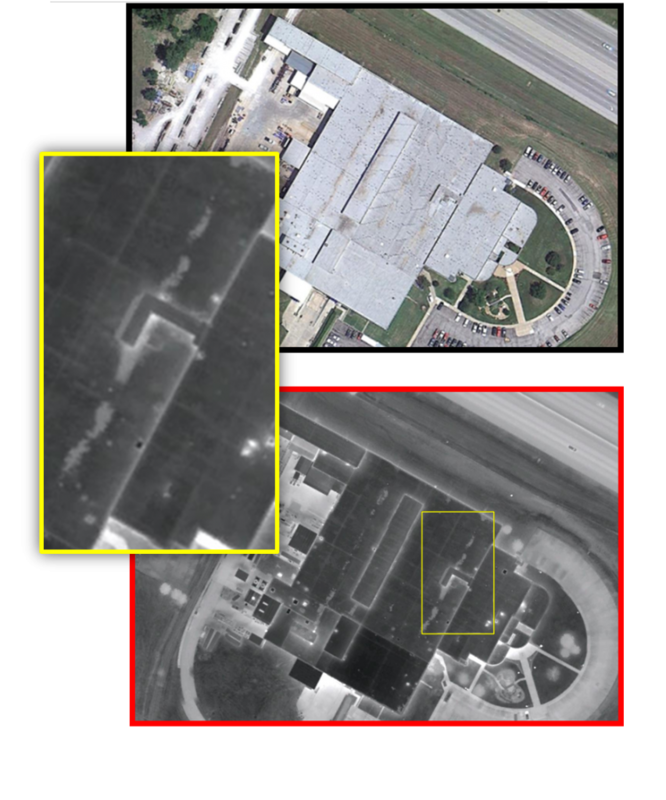 The highest resolution infrared images are usually found on the raw digital files, while the mosaic ortho-rectified imagery may be useful as a convenient reference when making building roof drawings or accompanying roof reports. Areas of roof moisture contamination often manifest themselves as warmer (lighter colored) areas that may be nebulous in shape and sometimes mottled in appearance, although they are commonly found in linear or puddle-like shapes. The linear shapes many times follow low areas, drainage routes, roof edges and seams. Puddle-like round or oblong shapes often form around roof penetrations such as mechanical equipment, standpipes, vents and drains. The wet areas are lighter in color because the latent heat (from daylight sunshine) in the trapped water mass is greater than in the dry, functioning insulation or roof substrate. After sunset when the roof structure cools down, wet areas of roof insulation and other wet materials continue to radiate heat because of their mass, higher thermal conductivity, and specific heat capacity, which allows our sensitive infrared cameras to detect the sources of heat and record them for later analysis. Infrared Thermography (IRt) is a well-known and proven non-destructive testing (NDT) method used to find moisture trapped in most roof types. 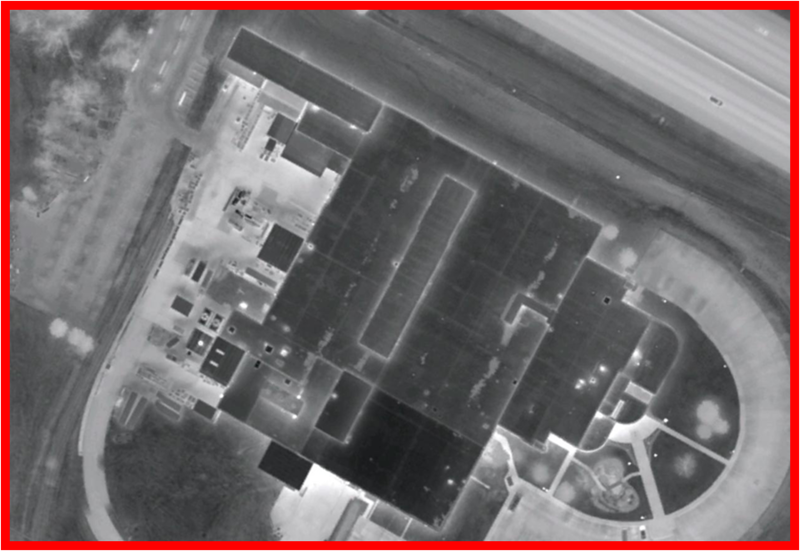 We have flown over large areas of cities with high concentrations of flat and low-sloped roofs and we have collected thermal infrared imagery. 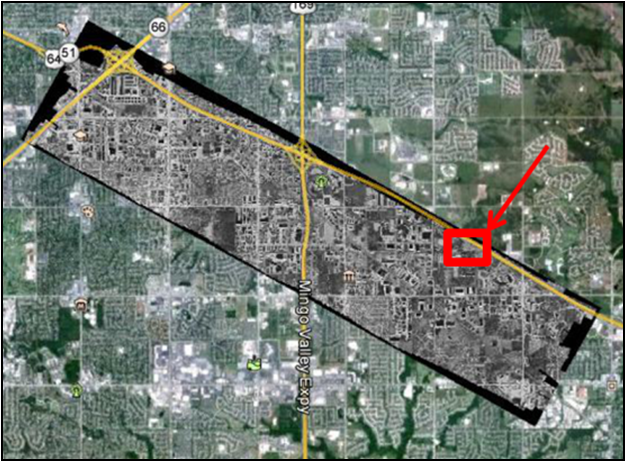 In some areas, we have also collected visible light imagery as well. 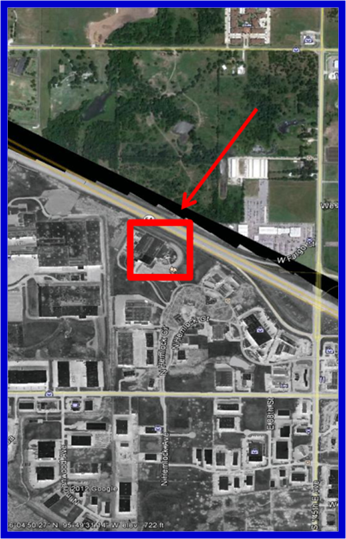 We are willing to license the use of this imagery to be used by your company for specific purposes. This service is for roofing professionals (roof consultants, roofing contractors and roofing manufacturers) who want to see the condition of the flat roofs in huge areas to get roof moisture information and market to the building owners. AreaScanIR™ Professional can be a powerful sales tool. Cold-calling a roof owner to allow one of your roofing professionals a chance to evaluate their roof is a tough proposition these days. But, if you know that the roofs have a wet substrate, then you know that they have roof problems and that they need your services. Being able to do a quick evaluation of the roof before you call, can be the linchpin in the sales process which can get your roofing professional in the front door. Stockton Infrared Themographic Services, Inc.